The Boys' Home Industrial School, originally known as the Home for Unconvicted Destitute Boys was established in 1858 by George William Bell. Its premises consisted of two houses knocked together at 44 Euston road, where the British Library is now situated. 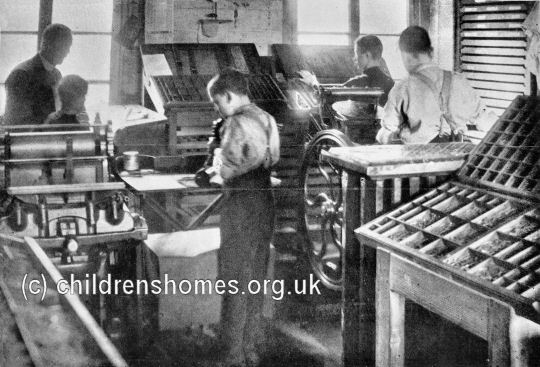 On 26th June, 1858, the establishment was licensed as a Certified Industrial School, allowing it to receive boys aged 10 to 13 years placed by the courts. As well as those under detention, the School admitted boys on a voluntary basis. An inspection report on the School in 1863 was less than satisfactory. The instruction of the boys was limited to two and a half hours in the afternoon, with the schoolmaster spending the morning teaching the superintendent's son, who assisted in the school as a pupil teacher. The inspector also felt that the boys spent too much time in carrying out the firewood, the cutting and preparation of which formed a large part of the industrial training. The following year, things had greatly improved, with the shoemaking and wood-cutting departments being praised. The tailoring department made and mended the school's clothing and there were classes for carpentry and brush-making. The classroom performance was generally good, especially in arithmetic, reading and spelling. In around 1860, a farm school branch of the establishment was established at East Barnet where boys taught farming and employed in outdoor labour. In 1865, the School was forced to leave its Euston Road premises after they were acquired by the Midland Railway for the construction of a railway goods shed. Its new base comprised a row of three houses Regent's Park Road. As a result, the maximum number of inmates was reduced to 120, and twelve of the boys were transferred to Industrial Schools at York, Manchester and Liverpool. The School was also hit by the death of its superintendent, Ebenezer Rayment. He was succeeded in the post by his son George, with Mrs Rayment continuing as matron. As an initial improvement to its new site, the School erected a large schoolroom, built on pillars in its rear yard. The basements of the houses were used as a dining room, washroom etc., the ground floors as workshops, and the upper storeys as dormitories and master's apartments. An interesting portrait of the establishment is given in an appeal for funds in 1866, which also refers to its plans for the construction of a chapel and hospital. 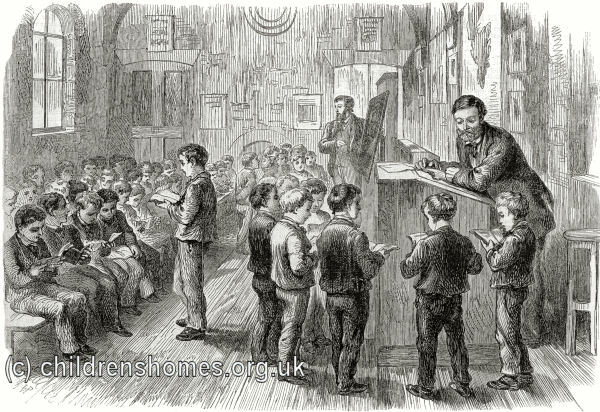 The Home at Regent's-park-road accommodates at present 50 poor boys, destitute, but never convicted of crime, who are here rescued from starvation and crime, lodged, clothed, fed, and trained to honest industry. These boys are admitted between the ages of six and thirteen. Carpentry, brush making, needle-work and tailoring, shoemaking, firewood cutting, and domestic work are taught. 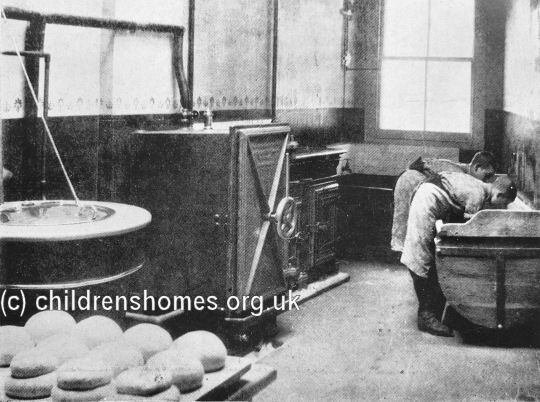 The Home at East Barnet accommodates 40 boys; there is a farm of 50 acres, in the cultivation of which, and in the care of the animals, the boys help. All the boys are lodged, fed, clothed, and educated within the Homes; a good rudimentary education is given to the boys; and, beside the farm-work or skilled trades, they are employed in cleaning the houses, in mending and washing their own clothes, and in helping to cook their meals. Thus they are trained to habits of industry, obedience, cleanliness, and order. It is the endeavour of the masters and matrons to become the true parents of these poor lads, to guide them no less by affection than by firm discipline, to establish a happy "family" feeling, and to attract their once ragged and disorderly pupils by the force of kindly teaching and good example. The Institution has no endowment of any kind, and depends entirely on voluntary contributions. The extent of the work depends entirely on the funds at the disposal of the committee, and it might by liberal help be increased fourfold with safety and entire efficiency. During the first seven years no destitute applicant ever was refused admittance; several boys thus received were found to be neither homeless nor destitute, and they were restored to their proper homes; none were turned away. But the success of tho Boys' Homes has been such that applications for admission are now far beyond the number that the committee can even inquire into. Some of the boys admitted into these Homes have been crossing-sweepers, beggars, or the sons of beggars; some the sons of domestic servants who have fallen into distress; some the children of parents who have died in the London hospitals, and thus left them destitute; some the children of vicious parents, who have deserted them or who have been removed from them by the arm of the law. Some of these lads are cripples, and two boys admitted have lost a leg by previous accidents. Former pupils are now serving in the army, the royal navy, and merchant marine, in domestic service at home as well as in Australia, Canada, and South Africa, and many are engaged in various trades and manufactures. The committee feel convinced that the maintenance of such Industrial Homes is the best and most promising mode of relieving tire metropolis of juvenile destitution and crime. Boys who have, from no fault of their own, fallen into destitution and want, and are on the high road to crime, have been prevented from becoming a burden to their country as beggars or thieves, and are being converted into industrious honest working men. The inmates of the Boys' Home in Regent's Park-road have for the past 12 months been unable to obtain sittings in any church, The neighbouring churches are all full during the usual Sunday services, but an opportunity has now occurred of erecting a temporary chapel for the Boys' Home, by the kindness of the Provost and Fellows of Eton College. The cordial approval of the Lord Bishop of London, president of the Boys' Home, of the plan for erecting St. Mary's Chapel in connection with this institution, and the help given by the Provost and Fellows of Eton, have inspired the promoters of the scheme with great faith that the pecuniary means will, by God's blessing, not be wanted for this holy work. The services of the Chaplains are offered, the choir is preparing, and all (except the building) is ready for immediate service. If liberal help be sent the Chapel may be opened on Christmas day, and will afford accommodation to 400 persons besides the boys. In 1868, a schoolroom raised on arches was built at the north side of the playground, with the space underneath used as a woodshed. The industrial training now comprised cabinet-making and carpentry, tailoring, shoe-making, brush-making and wood-chopping. Some of the boys visited local houses to clean knives and boots, and also worked as errand boys. In 1870, another house on the road was occupied, providing accommodation for the superintendent and his wife and 23 boys. A further large room was erected for use as a lecture and school room. The School now had a military-style band and the boys were also taught singing and gymnastics. In 1871, the Home appears to have had an annexe nearby at 7 Ainger Road. According to the census of that year, 45 boys were in residence aged between 6 and 16 years. 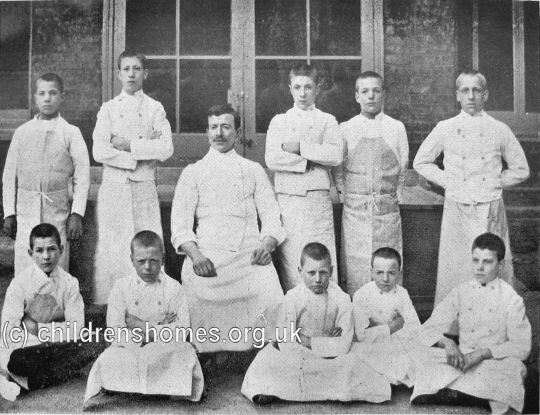 In 1875, it was decided to establish an Auxiliary Home at 197 Euston Road for boys sent out from the School to permanent employment in London. The establishment became known as the Home for Young Workmen. In 1876, Mrs Scott took over as matron. 1879, Mr Plummer, previously the schoolmaster, became superintendent, only to be succeeded the following year by the School's Chaplain, the Rev. Thomas Turner. In 1883, Mr I.(?) Embley was listed as superintendent, with Mrs Scott still as matron. A year later, Mr Henry William Embley was in charge, with Mrs Plummer taking over as matron in 1885. 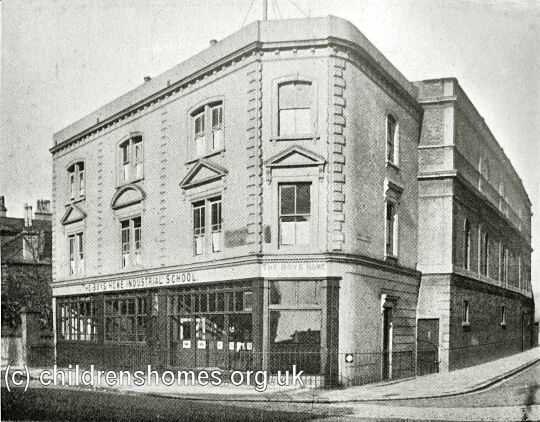 In January 1883, a property known as The Towers, on St George's Square, became the School's Auxiliary Home, and operated until the mid-1890s'. Also in 1883, an adjoining house and grounds were acquired, allowing a number of improvements to be made to the School and its accommodation. The Boys' Home site, Primrose Hill, c.1896. In November 1887, there were 153 boys in residence of whom 115 were under legal detention and 38 were voluntary cases. The School now had its own bakery where six boys worked. A printing shop was started in 1889. By 1889, the School band numbered 35, with many of its members going on to join the army as bandsmen. In the same year, all the inmates spent a week at Dover. Also in 1889,the superintendent and matron were Matthew Henry Embley and his wife Jane. Gymnastics and drill formed a regular part of the boys' routine. They also took exercise on Hampstead Heath and by 1900 were using a local swimming bath. A mark system was introduced at the School where privileges and monetary rewards were given for good behaviour. The money accumulated was paid out to the boys over three years following their leaving the School. In December 1900, another London home, known as The Grotto was converted for use as an Auxiliary Home, initially for the Boys' Home though later also for other establishments. In November 1903, the Embleys resigned their posts and were replaced by Mr Charles Francis Roache, the former schoolmaster, and Miss Alice Cane. In the same year, a 'jersey and knicker costume' was adopted for the boys' everyday wear and a smart Sunday uniform provided. Following a decline in the numbers being placed at the School, it closed in 1920. Several of the School's buildings survive, now converted to commercial use.